The Peace Post. This post stands outside of the main gate of the Shaka-In. It is a lasting tribute to the the highest arts of Kosho Ryu: Peace above all else, and the peaceful resolution of conflict. These ideals were taught there in 1235 and are still the overall theme of the arts practiced within the Sei Kosho Shorei Kai. Kumamoto Castle. Kato Kiyamasa was the Daimyo of this great castle in 1588. The story of Kosho Ryu must begin with a short history of the temple where Kosho was developed. In the year 778, Jozen (Shozen) Daishi was born. He was so bright that he was called the Child of God. When he was thirteen years old he decided to become a monk, so he shaved his head and began his studies of Buddhism at Yakushi temple at the foot of Mt. Ikura, in Kyushu, Japan. One day he climbed Mt. Ikura and was very impressed with the mysterious clouds over Mt. Kinkai. Eventually, he built a home there. When he was twenty-one years old he enshrined a statue of Shaka, a Buddhist deity in the house. A few years later he rebuilt the house and called it Shaka-In. At that time Kanmu, the emperor of Japan, became very sick and called for the monk to heal him. He was successful, and the emperor gave him the official title Jozen Daishi, which is a title of high mastery generally reserved for Samurai, and almost never given to anyone of lower stature. In addition, the emperor contributed huge rice fields and a large territory to Shaka-In. Jozen Daishi died in 835, at the age of 57. "Shakain Temple (formal name: Nishi-Hiei, Kinkaizan Dai-Onkyo-ji) was founded in 799 by Grand Master Jozen, an outstanding monk of the Tendai sect of Buddhism, at the request of Emperor Kanmmu. It is said that at that time, with the precincts filled with as many as 75 branch temples in the valley and on the top of the hill, the temple was visited by many followers every day. It flourished as a training center to study the principles of the Tendai sect, and, based on them, those of seven other Buddhist sects, including Shingon, Zen, and Jodo sects. Around 1588, the temple was ruined after Yukinaga Konishi (1555-1600), lord of Uto Castle, set fire to it. However, the main gate was rebuilt by Tadahiro Kato (1601-1653), the 2nd lord of the Higo Kumamoto domain and son of the famous Kiyomasa Kato (1562-1611). Later, with the main hall and reception hall reconstructed, the temple has become what it is today." Around this time, the temple may have had close to 100 buildings in all. 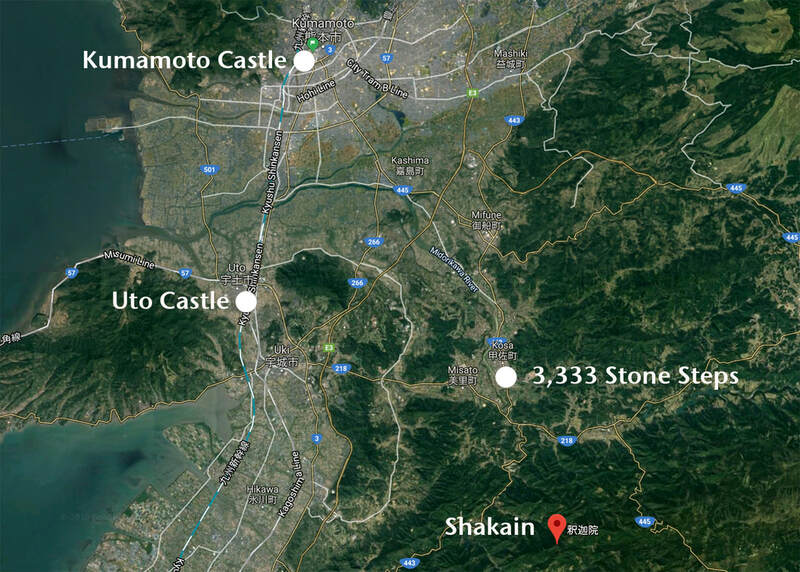 We know that in the year 850 Shaka-In caught fire and many of the then 75 monks' houses burned. Later, in the 1100s, fire again ravaged part of the temple area in an attempt by marauders to destroy the temple. Around the year 1235 a priest whom James Mitose called his first ancestor became enlightened to what we call Kempo. According to Mitose, this man was a martial arts master and a Buddhist priest studying at Shaka-In who found it difficult to be both. His religion taught him pacifism; his martial art taught him destruction. He needed something in between. He decided to meditate on this apparent contradiction under a big old pine tree on the temple grounds. A few years earlier, a fire in the Buddha house had forced the spirit of the Buddha out of the building and into the nearby pine tree. Many monks would go there to meditate so they could be close to their god. After meditating there for a long time he finally, "with the help of god", came up with something amazing. The monk came to an understanding of natural law which gave him a perfect method of defense and escape. He believed that true self-defense involved no body-contact. His methods postured him toward opponents in such a way as to make subsequent attacks continue to put the attacker further and further at a disadvantage. Using his illuminated strategies, the monk could make the attacker undo his own attack, and this could be done in a way that allowed for both to remain uninjured. The octagon would be used as a symbol for a method of movement in which jumping to particular angles based on timing and combative-distancing allowed strategies to be employed which confused and off-balanced the opponent. Reforming his opponents to become contributing members of society was his main goal. He and succeeding generations of his family members developed the art of Kosho Shorei Ryu as we know it today with all of this in mind. The monk chose this name for his art to reflect its spirit and its origins. Kosho Shorei Ryu means The Study of the Old Pine Tree School of Encouragement. The famous Sho Chiku Bai, which is the Pine-Bamboo-Plum family crest, is centered over an octagon and is still in use today as the symbol of Kosho Shorei Ryu. The monk wore a version of this crest. Kosho Ryu bujutsu, the wartime arts as Mitose referred to them, as well as all other aspects of Kosho Ryu, are based on the revelation received by the monk under that old pine tree over 750 years ago. Kosho Ryu bujutsu was a separate area of Kosho Ryu which was studied only by the Sohei. The sohei were warrior monks whose job it was to protect the temple and its territory as well as to fight in wars supported by the temple. They typically wore normal monks' robes during peace time and carried a short staff known as a jo. During war time, they would wear armor under their robes, and ninja-like masks covering their faces. Their primary weapons during battle were a large halberd known as a naginata, as well as a typical Japanese long sword known as a tachi. The sohei of Kosho Ryu were skilled in escaping arts, which were explained earlier; controlling arts, which are similar to, but older than, jujitsu or aikido; as well as destructive arts, which are similar to, but older than, karate. James Mitose said that at one time there were over 400 monks living and studying at the temple. These warrior-monks were a potential threat to the political control held by Konishi Yukinaga, the Daimyo of Kyushu at the time. It was for this reason that in the year 1588, Konishi sent 5000 samurai to destroy the temple. The 400 sohei at Shaka-In were defeated by the overwhelming mass of samurai, but still somehow managed to protect some of the most precious temple artifacts, documents, and the sacred old pine tree itself. Konishi confiscated all of the temple's territory and burned down many of the monks' houses, as well as the 49 branch temples in the area. His head was later removed by perhaps one of the most famous warlords in Japanese history, Kato Kiyamasa. Kato was the daimyo of nearby Kumamoto Castle and a very convicted buddhist. Konishi was a Christian and had earlier gone against the samurai code of bushido by refusing to commit seppuku, ritual suicide, after being disgraced by allowing himself to be captured. He and Kato had been commanders together during the Japanese invasion of Korea years before. Kato held disdain for Konishi ever since his refusal to commit seppuku when captured, which in Kato's eyes, brought dishonor to Konishi, to himself, and to all samurai. Thirty-two years later, the son of Kato Kiyamasa and a great samurai in his own right named Kato Tadahiro rebuilt the temple. From that time on the martial arts of Kosho Shorei Ryu became what Mitose called secret. They were taught only to family members in order to maintain tradition. Kosho Shorei Ryu martial arts were passed on in secrecy for 21 consecutive generations until James Masayoshi Mitose handed the art to the first non-Japanese in its history, an American named Bruce Juchnik. James Mitose hated the martial arts for what they did to people, but he knew that he could not let his family tradition die. Although numerous people were introduced to Mitose through Mr. Juchnik and may have received some philosophical or psychological knowledge from Mitose, there is no doubt to anyone who was present at that time that Bruce Juchnik is the only one who learned Mitose's family secrets concerning Kosho Ryu martial arts, and who received knowledge of the true art of Kosho Shorei Ryu Kempo. These facts are attested to by many people who were present during the time Mr. Juchnik studied with Mitose, including George Santana (the man who introduced them), Eugene Sedenio, Rick Alemany, and students and associates of Juchnik Hanshi at the time, some of whom appear in two videotapes available through SKSKI called Controversy and The Truth behind the Controversy.